George Glendon thanked the Cod Army for their support as he embarks on a fresh chapter in his career. Glendon, 23, is one of three first-team squad members to be released by Fleetwood, with Chris Neal and Ricardo Kip also departing in June. Midfielder Glendon joined on loan from Manchester City in the summer of 2016 and made the move permanent in January last year. 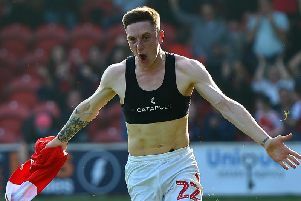 He made his first Football League appearance in the 2-1 defeat at Port Vale in November 2016 due to Jimmy Ryan’s injury and went on to become a regular under Uwe Rosler in that promotion-chasing term. He remained a regular under Rosler this season but found game-time harder to come by in John Sheridan’s 13-game spell, with just three starts and two substitute appearances.